In January last year, I visited Jordan and Lebanon, just days after becoming head of the UN Refugee Agency. There I saw for myself the consequences of the world’s largest refugee crisis. On that visit and subsequent ones, I met Syrian refugees living in difficult conditions, struggling to make ends meet, often relying on their children, who had abandoned their education to bring in essential income. The pressure on sanitation, health, electricity and other services of the host countries and communities was evident. In truth, we were grappling with many of the same issues I faced in my first assignment with UNHCR 30 years ago in Eastern Sudan, dealing with hundreds of thousands of refugees from Ethiopia. How do we make sure refugees are able to find safety, to flourish and contribute to the communities in which they live? How can we help host countries, already reeling from the fallout from a major conflict on their doorstep, cope with the presence of so many newcomers? How do we help find solutions? UNHCR’s goal to help and protect those fleeing conflict and persecution, and to help resolve their situation, has remained constant over the years. However, in a world of accelerating change, including rapid urbanisation, the way we do so needs regular adaptation. Nowhere has this need been spelled out so clearly as in our response to the Syrian refugee crisis. It began slowly in 2011 but swiftly gathered pace in 2013 and by the end of 2014, Syrians had become the largest refugee population in the world. Early hopes for a resolution faded and governments and humanitarian agencies had to adapt quickly to respond to the huge numbers of refugees. More than 5 million Syrians have now found refuge in nearby countries, including more than 2.9 million in Turkey (now the largest refugee hosting country in the world) and large numbers in Lebanon, Jordan, Iraq and Egypt. Most of them are in cities, towns and rural communities. 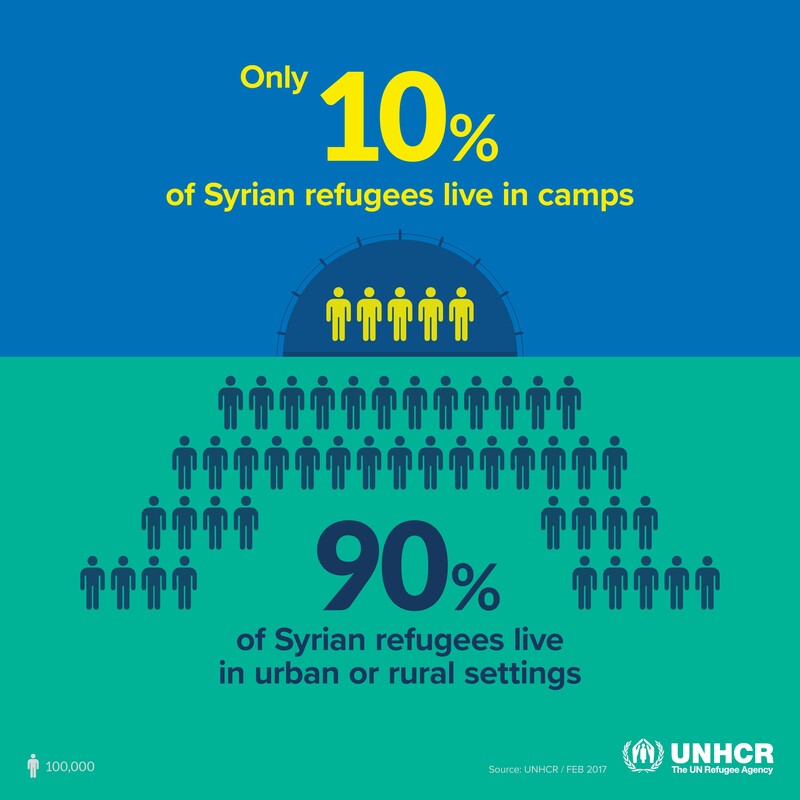 Despite the attention focused on Jordan’s Za’atari camp, just 10% of Syrian refugees in the region today live in a camp setting. This is not unusual. Globally, most refugees live in local communities, not in camps and, increasingly, in towns and cities. Ten years ago, UNHCR was running large urban refugee programmes in Syria and Jordan, in response to an exodus of 1.5 million refugees from Iraq; many of our operations drew on the lessons from that experience. However, the pace and scale of the Syria crisis and the fact that refugees were scattered over so many locations – with 1,700 in Lebanon alone – spurred our efforts to try new approaches, harnessing new technologies in partnership with companies and revolutionising the way we listen to refugees and meet their needs. Standing in UNHCR’s bustling registration centre in Amman in January last year, I was struck by the innovations that had shaped this operation. I met refugees having their irises scanned as part of our biometric registration system, and visited refugees in their homes with colleagues using tablets to upload information onto our inter-agency Refugee Assistance Information System – a far cry from the notebook and pen of my days in Sudan. Adaptation is part and parcel of how UNHCR works, a necessity reinforced over decades of responding to refugee emergencies. Many of the innovations forged in this crisis had their roots in operations elsewhere. But the Syria crisis was the first time that so many refugees had fled to middle-income countries with growing economies. Jordan and Lebanon, for example, each had an active private sector, established infrastructure and services, and an environment conducive to innovation through technology. It meant, for example, that we could work with banks to deliver cash to refugees, reducing overheads and fraud, and giving a choice to refugees to buy what they needed, avoiding the stigma of distribution queues. Giving cash to refugees is not new for UNHCR, but we massively increased this type of aid in our operations to help Syrian refugees in Turkey, Iraq, Egypt, Jordan and Lebanon, in partnership with private companies and other partners. Without standard identity documents, refugees often have difficulty opening bank accounts, but UNHCR was able to negotiate agreements to authenticate identities using our registration data. We formed a partnership with the Cairo-Amman bank in Jordan, the first in the region to use biometrics in retail banking, to develop the world’s first system allowing refugees to withdraw cash assistance using an iris scan without the need for cards or PIN codes. This pioneering programme evolved into the Common Cash Facility now used by nine humanitarian agencies to help refugees in Jordan, and a similar scheme is now in place in Lebanon. We are exploring ways to expand this in the future, to help refugees receive remittances, for example, or build a credit history and economic identity to enable access to more financial services. Our biometric registration system, now using iris scans throughout the region, has been at the heart of efforts to help Syrian refugees. It forms the basis of managing individual cases and provides data that can be shared with other agencies (applying data protection safeguards). This helps us better to assess refugee needs and speed up the delivery of aid. It is used to match refugees with resettlement opportunities and authenticates refugees’ identities when they leave for third countries. The smarter use of data has been a key feature of our Syria operations. We have worked with the World Bank and the American University of Beirut, for example, on economic modelling to refine how we assess vulnerability, vital in ensuring the limited aid available reaches those who need it most. The next step will be adopting an approach that helps lift refugees out of poverty by encouraging economic opportunities and building self-reliance. Effective communication with refugees is critical, especially when they are spread out over many locations or living in towns and cities. Face-to-face interaction remains important, and we ramped up our presence in the field accordingly, but we now complement this with other channels such as telephone and the Internet, which refugees increasingly prefer to use. We still have a long way to go, but our communication with refugees in this region today is much more of a two-way street. Our state-of-the-art call centre in Amman, a 30-line system handling 35,000 calls a month, or the Facebook group run by a refugee outreach worker in Beirut are more typical than the camp notice boards, radio broadcasts and megaphones we relied on in days past. Many of the tools we use today, such as networks of volunteers, help lines and text messaging, were piloted during the Iraq refugee crisis a decade ago. In Turkey, asylum-seekers and refugees have been able to receive updates on the progress of their cases via a secure web interface for a decade. The Syria crisis coincided with huge strides in what we now call the fourth industrial revolution, in which technology is integrated into our lives. For many refugees, connectivity is almost as important as food and shelter, allowing them to keep in touch with family, to follow events at home, to seek help and to earn a living. Our surveys show refugees will spend up to 30% of their income to be connected, so we are working with mobile network operators and regulators to see how being connected can be more affordable and easier for refugees. New-found connectivity brings dangers as well as opportunities, making refugees vulnerable to misinformation and exploitation. Smugglers, traffickers and scammers are also connected, using technology to prey on the vulnerable. In this environment, our communication tools, using social media, text messages, interactive websites and modern call centres throughout the region, have become central to our protection strategy. 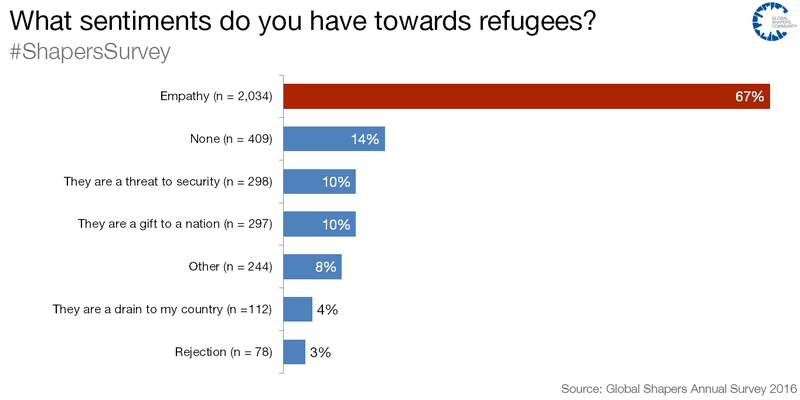 Our role as a trusted source of information is more important than ever, and research tells us that refugees have confidence in UNHCR amid the rumours and half-truths. Connectivity has also provided new ways for refugees to hold UNHCR and our partners accountable by providing tools for feedback and making communication more of an exchange. We are not yet there, but we are making huge strides. One of the main lessons from the Syria refugee crisis was the importance of faster, greater and more reliable support for host governments and communities. The sheer pace and scale of arrivals, and the fact that in 2015 so many began to move to Europe, helped awaken global recognition of the need for stronger support to help host governments weather the shocks of huge refugee movements. In this respect, the Syria crisis also led to broader innovations in the international system, based on the understanding that large-scale refugee movements require a more comprehensive response from the start, concentrating on building social cohesion by including refugees in local economies, as well as health and education systems. Trade, market access and private sector investment have become new instruments for sharing responsibility globally for large-scale refugee crises, together with new methods of channelling development support. The Global Concessional Finance Facility, launched by the World Bank last year to direct development aid to middle-income countries hosting refugees, drew directly on experience in the MENA region. In the New York Declaration on Refugees and Migrants, adopted in September last year, 193 UN member states reaffirmed the principles of refugee protection and committed to finding new ways of sharing responsibility for refugee crises. This requires a whole-of-society approach that encompasses the contributions of all: governments, business, civil society, international financial institutions, and those involved in development. Innovation will be fundamental to making the vision of the New York Declaration a reality. We must explore all options, adapt what others have used and, when none exist, invent them. Our experience in the Middle East has shown the potential of new creative partnerships between agencies such as UNHCR and companies in the private sector. We could, for example, build on our experience in registration technologies and digital connectivity to help refugees forge a digital identity over which they would have control, and increase their opportunities in a rapidly changing world. This could include something as simple as updating their records, adding education certificates or pursuing education online, to increasing the range of financial or other services they can use. It could also lead to a broader change in the way the world engages with refugees, revising systems and processes and adopting radical new forms of collaboration. This means embracing change as a way of securing the values and principles of international refugee protection, and helping refugees become agents of their own future.